Value-added tax (VAT): What is its impact on the investment market and how to minimize it? Ever since the oil and gas slump and the entire GCC region has resorted to the non-oil sector to drive their economic growth and diversify their economies. The performance of the non-oil private sector in the last couple of years has proved to be resilient despite the unfavourable macroeconomic environments of low oil prices. One of the fastest growing non-oil sectors in the region is development and construction sector. This sector is of paramount importance to the GCC as a whole as it supports large numbers of livelihoods as well as delivering the necessary infrastructure, commercial and residential spaces that are so important to the continued development of the region. The introduction of Value-added Tax (VAT) at the beginning of 2018 left the impression that the development and construction sector will suffer greatly as a result. However, that doesn’t necessarily mean that the sector won’t face any challenges because it will; especially that those who operate in this sector are still trying to figure out the effect of such decision on the industry. 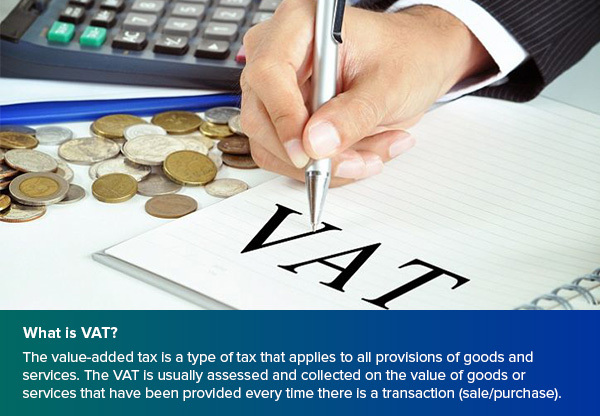 The value-added tax is a type of tax that applies to all provisions of goods and services. The VAT is usually assessed and collected on the value of goods or services that have been provided every time there is a transaction (sale/purchase). 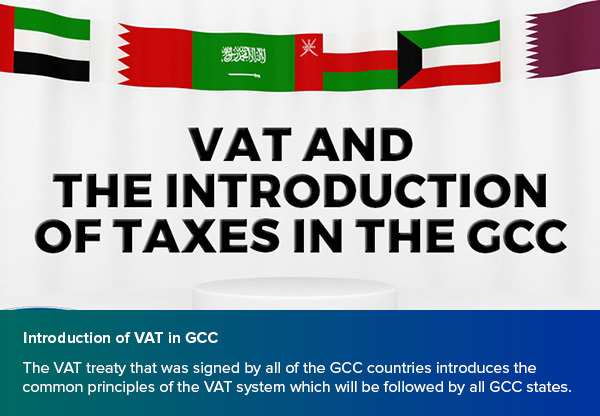 The VAT treaty that was signed by all of the GCC countries introduces the common principles of the VAT system which will be followed by all GCC states. 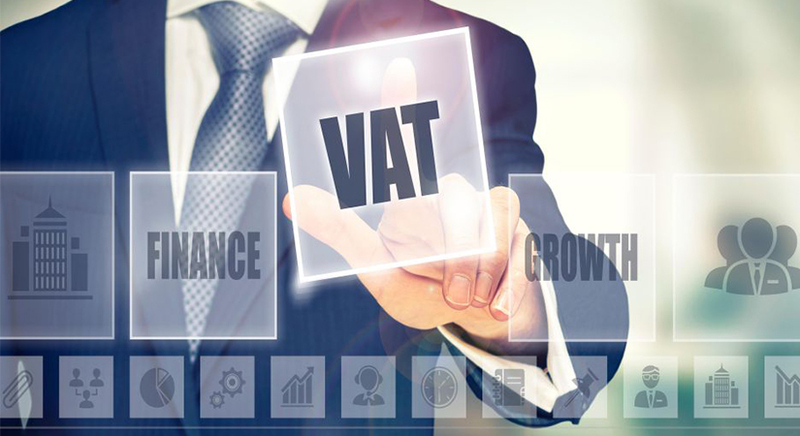 And even though many businesses now in the region started to have a clear idea on how the VAT system will operate, but there are some “grey areas” that still remain unclear and will be sorted out once each of the GCC countries releases their own VAT laws. 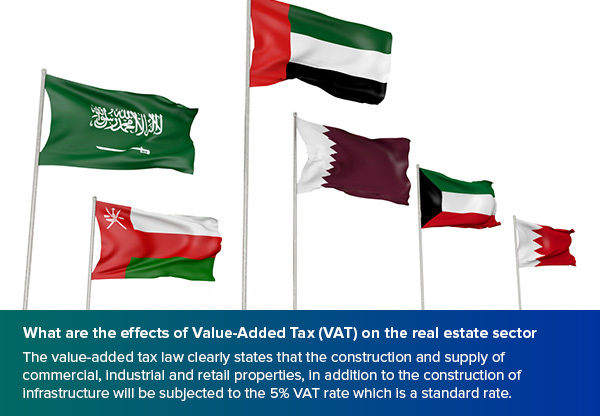 What are the effects of Value-Added Tax (VAT) on the real estate sector in GCC? 1- Standard-rated and this means businesses will be subjected to 5% rate. 2- Zero-rated and this means no VAT charged to customers but can recover input tax. 3- Exempt and this means no VAT charged but no input tax recovery. And now let’s talk about the effect of such decision on the real estate sector. 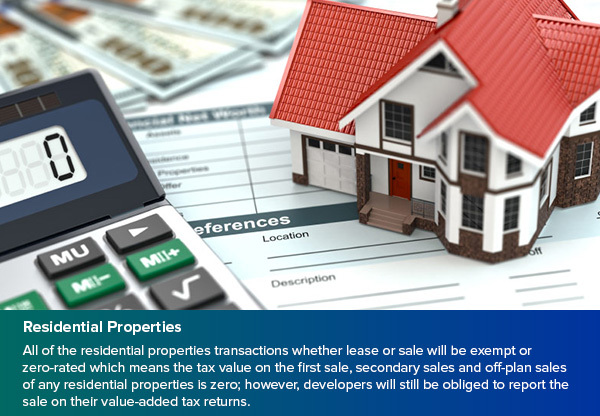 All of the residential properties transactions whether lease or sale will be exempt or zero-rated which means the tax value on the first sale, secondary sales and off-plan sales of any residential properties is zero; however, developers will still be obliged to report the sale on their value-added tax returns. So, will residential property prices rise in the future? The answer to this question would be yes. Even though residential properties aren’t subjected to VAT but property services are. ِAnd even though tenants won’t have to pay VAT according to the new law, landlords won’t have the same luxury. Hence, any service that is related to the property such as maintenance services will surely be subjected to VAT tax. So, maintenance fees will go up, which makes lease or sale prices vulnerable to a huge and sudden increase. 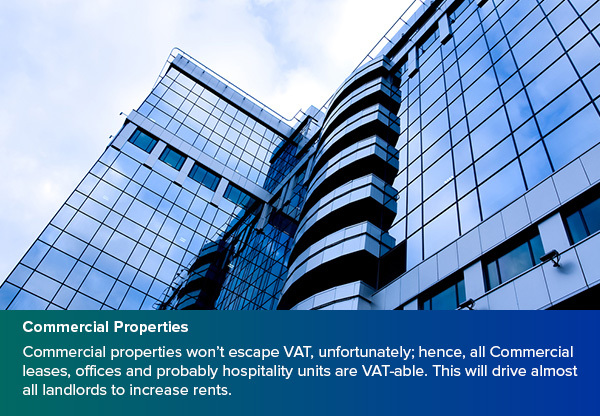 Commercial properties won’t escape VAT, unfortunately; hence, all Commercial leases, offices and probably hospitality units are VAT-able. This will drive almost all landlords to increase rents. 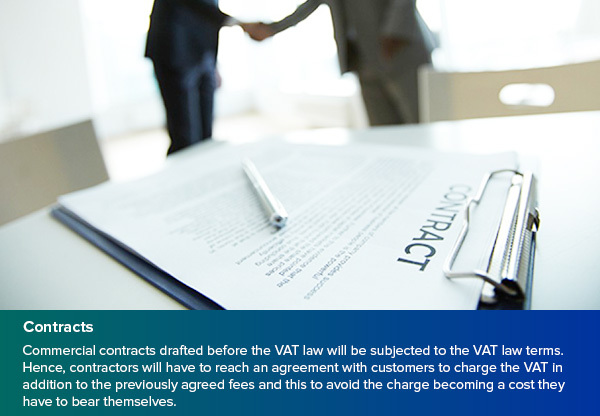 Commercial contracts drafted before the VAT law will be subjected to the VAT law terms. Hence, contractors will have to reach an agreement with customers to charge the VAT in addition to the previously agreed fees and this to avoid the charge becoming a cost they have to bear themselves. As for rental leases, it is worth noting that contracts drafted before the issuing of the new VAT law and expire in 2018, the tenants will be obliged to pay the VAT cost for the remaining period even if the entire cost of the contract was paid prior to 2018. 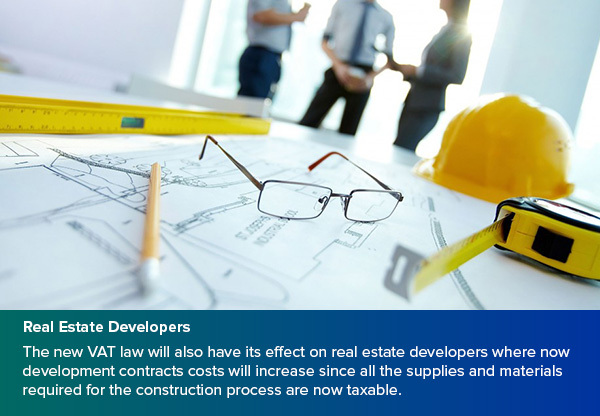 The new VAT law will also have its effect on real estate developers where now development contracts costs will increase since all the supplies and materials required for the construction process are now taxable. Developers can work around this dilemma by restructuring their procedures to avoid any potential losses that might occur due to the new tax law. 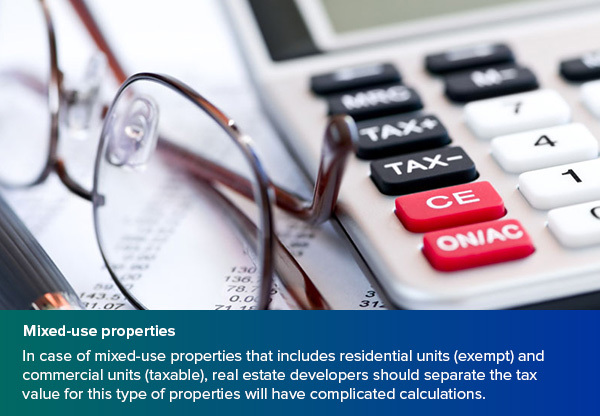 In case of mixed-use properties that includes residential units (exempt) and commercial units (taxable), real estate developers should separate the tax value for this type of properties will have complicated calculations, hence, developers should put that in mind before starting on any project as any lapses in such calculations will make VAT an additional cost for the business, impact its competitiveness and may give rise to penalties.